The fifth edition of the Dawson Daily News Print & Publishing Symposium again brought together an eclectic mixture of talented artists employing a wide range of styles and techniques for printmaking and content creation. With a hands-on, artisanal, and instructional approach, the workshops and open studios ranged from the traditional to the avant garde, printing on a variety of media in many unique ways, and covering the print and publishing craft from inception of ideas to final packaging of completed works. This year the Symposium kicked off on Thursday evening with the first-ever Dawson Daily News Book Fair, a marketplace of books and publications, featuring original works from local artists and authors, who were also available to sign their work. Justin Apperly launched his art book From Dust to Oaxaca, featuring a photo essay of his six-month long motorcycle journey from Dawson to Mexico and back. There were also custom zines from Dawson artists, and books (printed and digital) from resident authors. 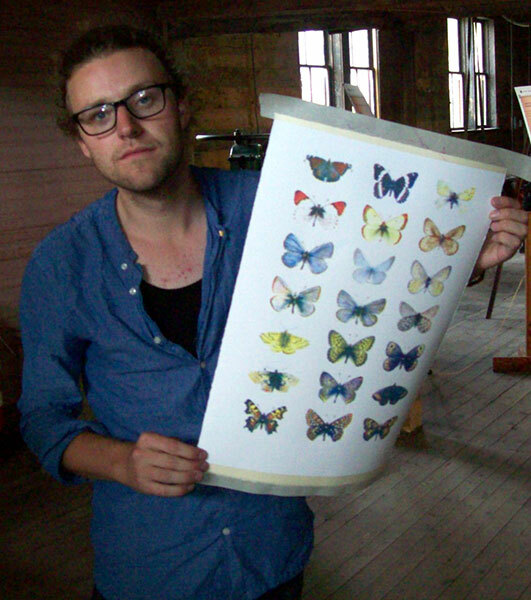 Mathias Macphee with a final silkscreened print. 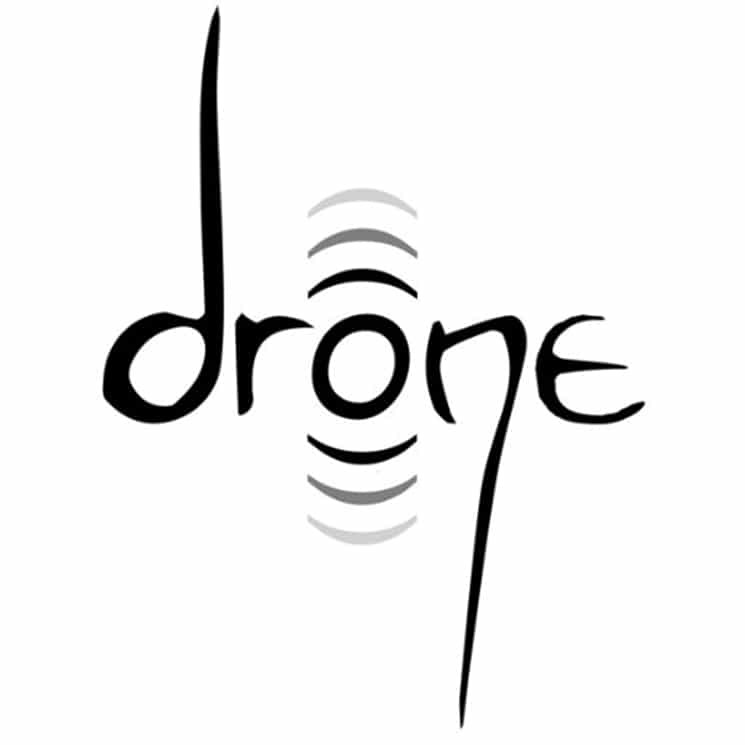 On Saturday the Symposium proper kicked off. 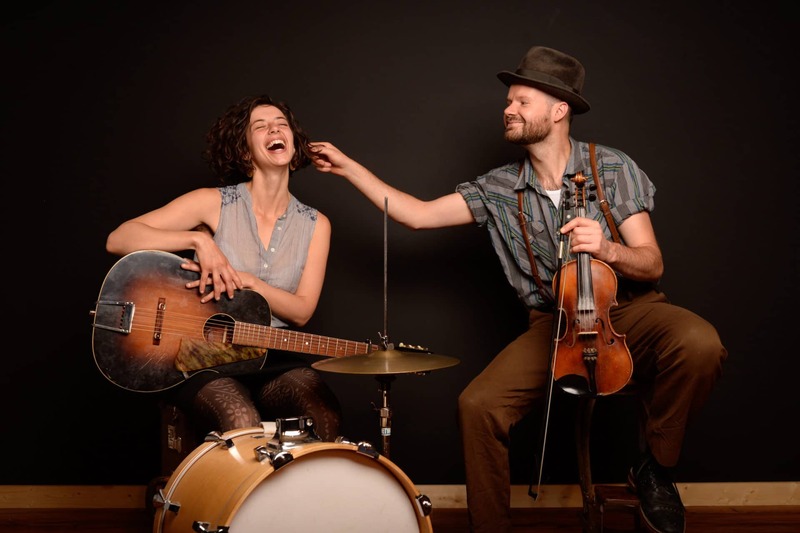 This year, in addition to the open studio projects and workshops inside the heritage Dawson Daily News building, there were numerous activities taking place outside in the adjoining lot under canopies and tents. Fortunately the weather (which had decidedly been on the soggy side in recent weeks) cooperated splendidly and delivered sunshine for the weekend. 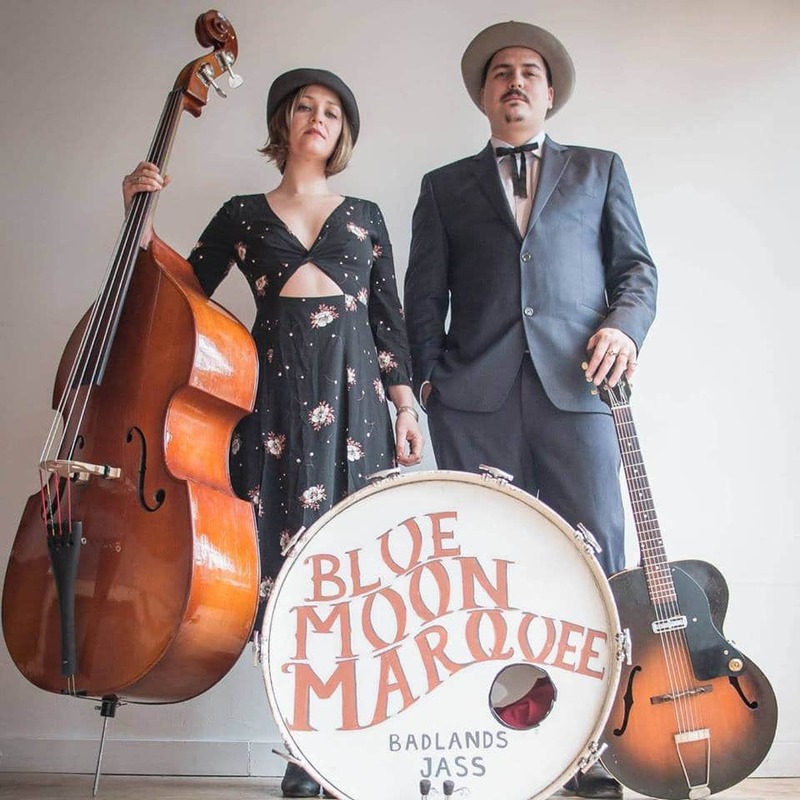 In this outside area, Mary Tremonte gave hands-on demonstrations of silk screening throughout the weekend, squeeging her custom hand-drawn designs onto bandanas, as well as other occasional articles of clothing. Hung from the fringe of the canopy, the bandanas could be seen flapping like flags when the breeze stirred. Perhaps this is what drew the attention of the many kids who showed up to try their hand at the process. There was another trio of other notable silk screening art projects taking place as well. 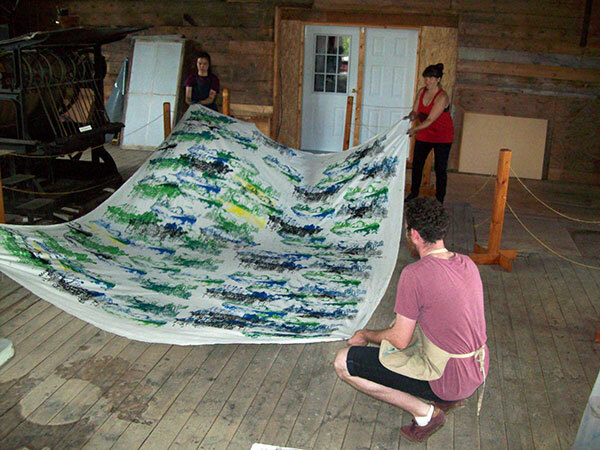 Mathias Macphee and the Silkscreen club demonstrated the production of exquisite multi-coloured prints that required multiple ink passes and meticulous calibration, while artists Michael MacLean and Elizabeth Xu worked together to execute Mountain Landscape Pattern, a large, collaborative, fabric-print installation. The sun was more than just a meteorological bystander, it was also an active component in the work of Bill Horne. The B.C. artist demonstrated photo-stencil exposing in order to produce silk screens for printing onto various media, utilizing an enclosed “dim room” tent and an array of cool-looking custom hardware in the process. As part of the start-to-finish scope of the symposium’s topics, Nathaniel Marchand demonstrated the craft of paper making. 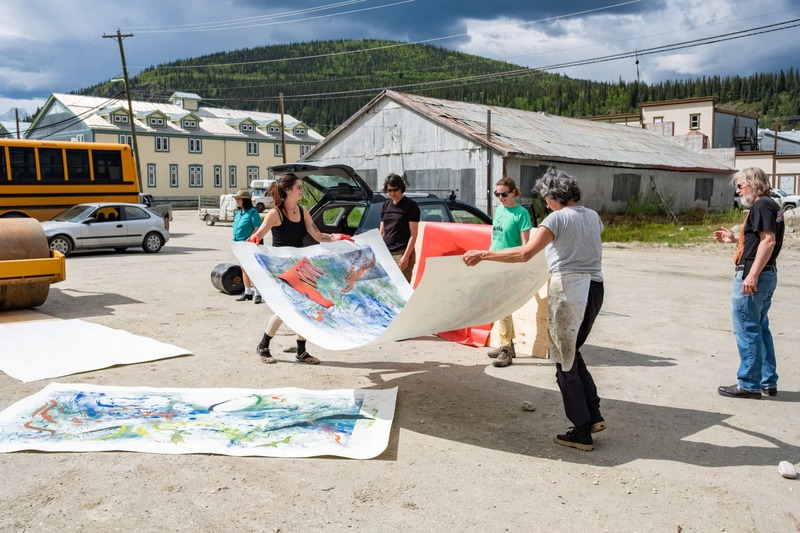 Adding a definitive Yukon flavour, Marchand used the fibre from fireweed plants for the pulp in the beautifully-textured paper sheets he produced over the weekend. Bii Horne tests the exposure for a photo stencil. Inside the building, Sierra Megas gave a workshop in introductory bookbinding, introducing participants to the hand-binding of books using the Coptic stitch. Using samples of different finished binds as reference, workshop attendees were themselves able to try stitching with hands-on guidance. It was double duty for Megas, whose art exhibition Lost & Found also graced the walls of the Dawson Daily News building’s front room. 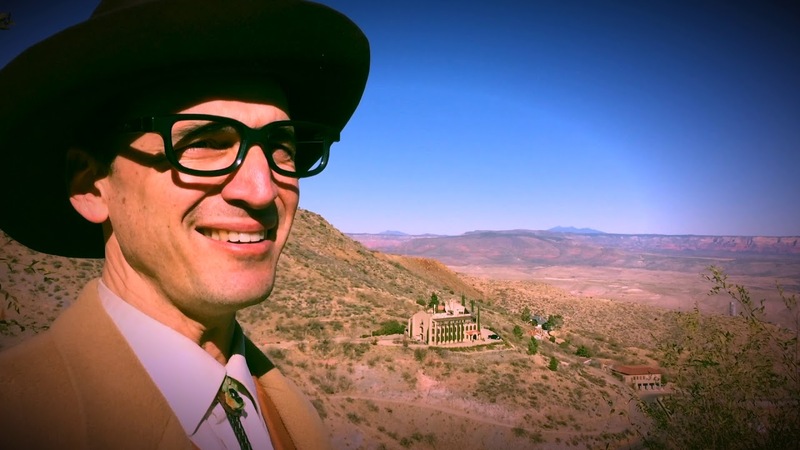 The Symposium has been fortunate in the past to draw on the skills of the Writers-in-Residence from Berton House, and this year was no exception. On Saturday afternoon current resident Claire Caldwell offered a Poetry Lab to help poets, aspiring and seasoned alike, flex their lyrical muscles. 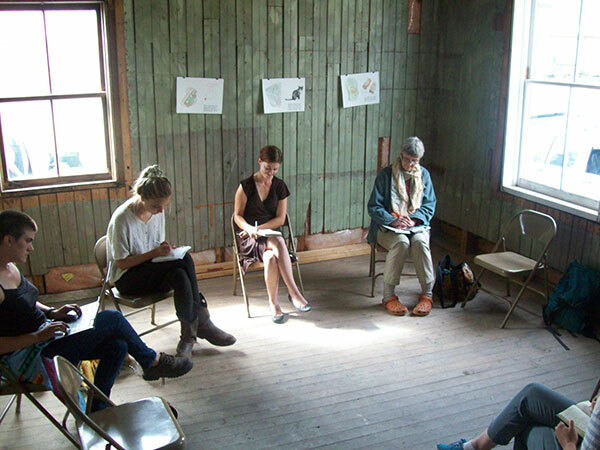 The workshop employed a series of poetic experiments “to transform the raw ingredients of language into bright and bubbling concoctions.” Judging from the attendance and enthusiasm, Dawson is home to a legion of aspiring poets. 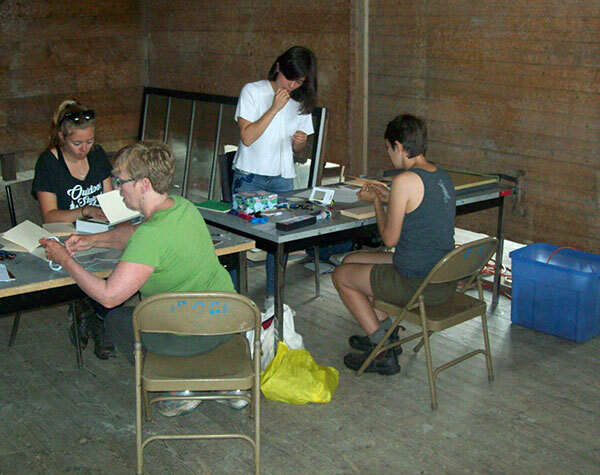 Sierra Megas (standing) oversees the book binding workshop. 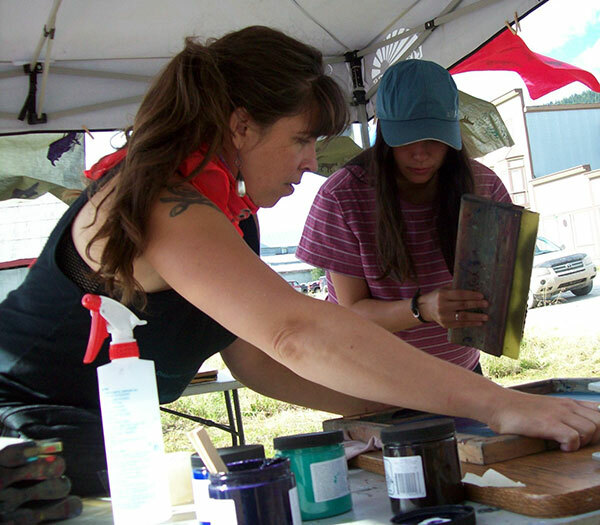 In the back of the building, among the vintage presses, another visiting artist, Claire Kujundzic, had an open studio throughout the weekend demonstrating collography. This process employs a collage of materials glued on to a “printing plate,” usually made from a square of cardboard. When the glue is dry, it is shellacked or varnished so that it can be painted with acrylics. Paper is then pressed on to the surface to produce a print. Two artists, one local and one visiting, who have been continuously involved with the Symposium since its inception, were back for the fifth edition. Master Printer Peter Braune from New Leaf Editions, has been the driving force behind the restoration of the vintage Chandler & Press letter press that forms the centrepiece of the event. 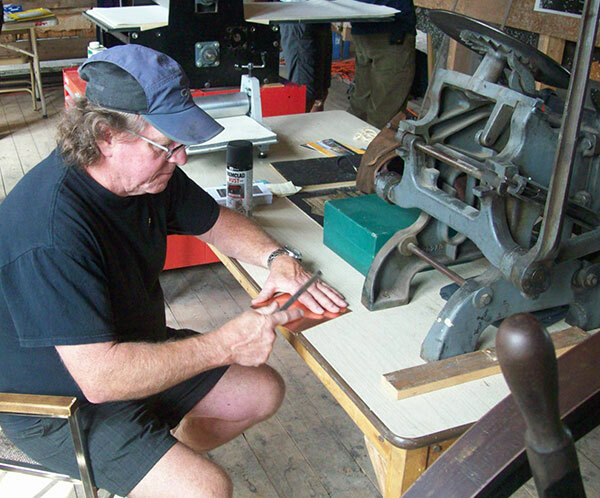 A versatile and seasoned artisan, Braune offered letterpress and etching demonstrations as well as hands-on guidance to artists and drop-in visitors alike throughout the weekend. 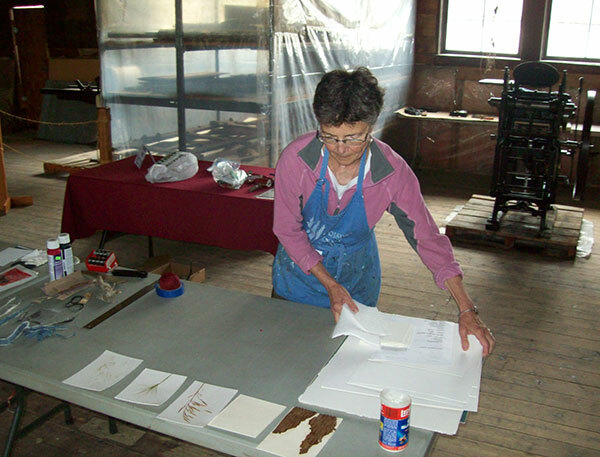 Claire Kujundzic prepares materials for her collography workshop. 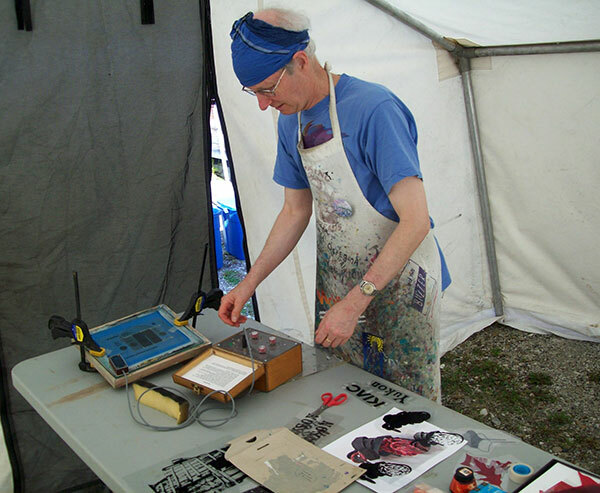 Dawson stalwart John Steins held an open studio in wood-block printing throughout the weekend. When not painstakingly carving away at his latest creation, Steins showed visitors other beautiful wood blocks he has produced in the past, as well as the prints made from some of them. While the digital age was certainly not ignored (for example, Dawson Writer-at-Large Dan Dowhal gave a workshop in indie publishing employing free and easy-to-use online services like Amazon’s Create Space and Lulu.com) it is the unique handcrafted works that continue to shine and capture the imagination of visitors to the Dawson Daily News Print & Publishing Symposium. Mass production will always have its place, but the Symposium demonstrates the irrepressible and irreplaceable role of artists, writers, and skilled craftspeople. 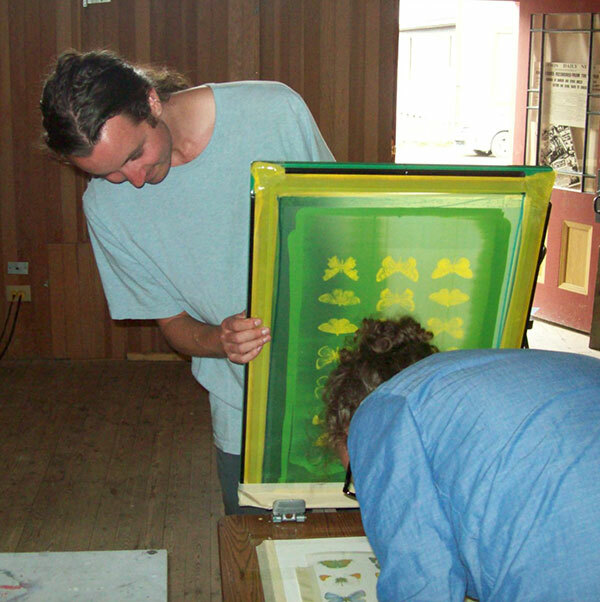 Taking a break from his papermaking workshop, Nathaniel Marchand helps the Silkscreen Club. 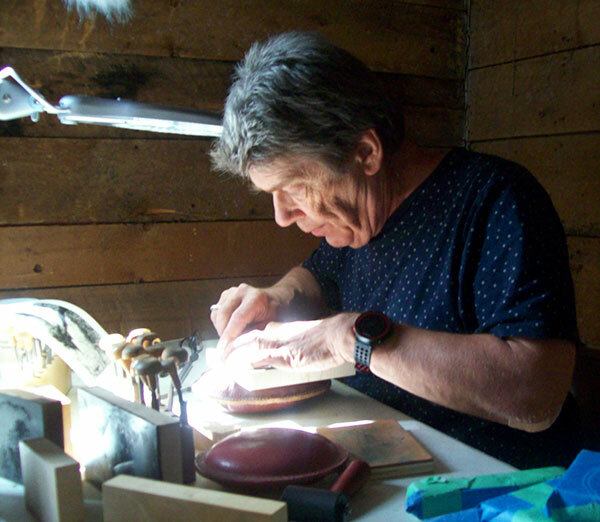 Master printer Peter Braune prepares a copper plate for engraving. Basking in the glorious sunshine the weekend offered, John Steins works on carving a wood block used for printing.